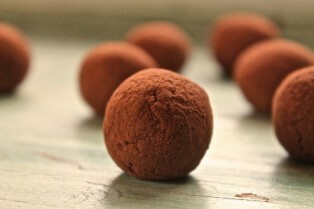 These chocolate orange truffles are easy to make. Perfect sweet treat for the whole family. In a medium sauce pan over a low heat, stir the cream, butter and chocolate until it is melted. Remove from the the heat and stir in zest and extract. Pour the mixture into a shallow baking dish. Then place it in the fridge 40 min at least. Scoop out the chocolate and form into balls using your hands. Roll into your dipping choice and serve.